Travelling in space has always been a multi-million pound business. More like the voyage of Colombo to discover the new world than even a first class transatlantic flight. In the last decade or so, however, technology has offered the possibility to travel into space at a very low cost. Next to the multi-million pound space missions to Mars, a plethora of small satellites built by amateurs in their basement have populated the space around the Earth. No one has dared to go beyond low Earth orbit, though. 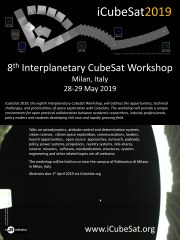 This paper will present ideas and work done for the UK Space Agency on how to use cubesats beyond LEO. In particular the paper will present ways to reach the Moon with a combination of low-thrust propulsion, solar sails and natural dynamics. We consider transfers that can be realised with micro or nano spacecraft with high area-to-mass ratio, propelled by a simple propulsion engine (such as chemical with a specifc impulse ca. 100 to 300s or arcjet/resistojet), and possessing relatively small solar panels to provide power and a small thrust due to solar radiation pressure. With this small hybrid design, interior transfers in the circular restrieed 3-body problem between the pair of primary and secondary masses (e.g. the Earth and Moon) are attempted using solar radiation pressure and multiple small impulses. Starting from a GTO about the primary mass a basic optimization method of sequences of manoeuvres is used to achieve the transfer. Spacecraft coasting arcs are patched together with locally optimal control laws to optimize performance while minimizing computational cost. The spacecraft is then injected into a stable invariant manifold leading to the system’s Lagrange L1 point after successive small maneuvers and coasting arcs. Finally, temporary or permanent capture around the Moon can be performed using the remaining resources at hand and a new technique called longevity map.